Mars is the 4th planet in the solar system in order of distance from the Sun. It is a small, rocky planet 7 times smaller and 10 times less massive than Earth. Mars is one of the 4 telluric (rocky) planets in the solar system. It is colder than Earth, with a mean temperature of –63°C. 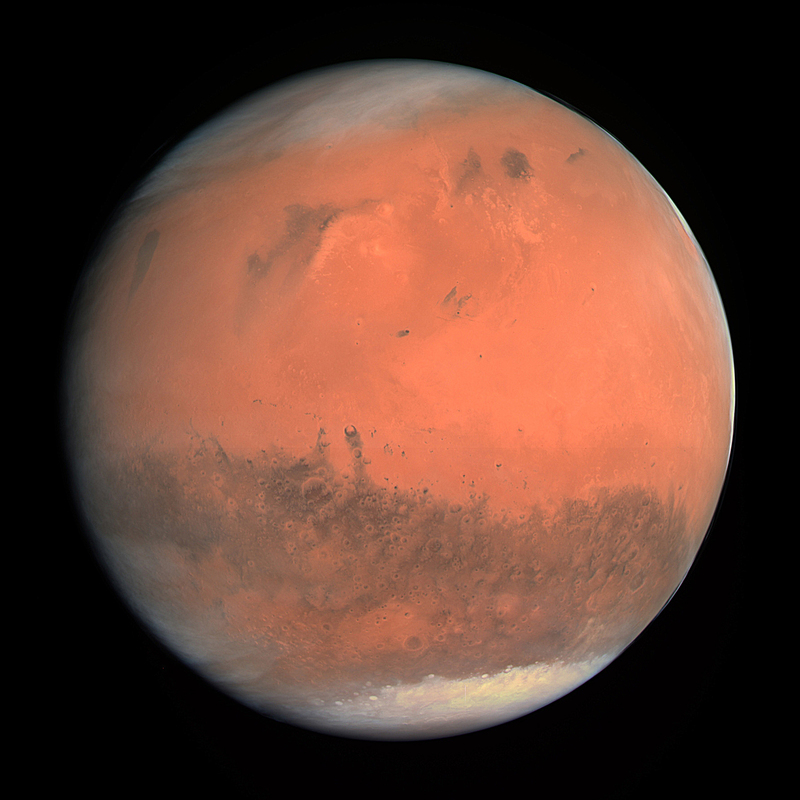 It is called the “red planet” because its rocky, desert-like surface is covered in a reddish dust rich in iron oxide. Surface features include many very high volcanoes and deep canyons. Mars has two known small moons: Phobos (about 22 km across and 9,400 km from Mars) and Deimos (about 13 km across and 23,500 km away). Not a great deal is yet known about Mars’ interior structure. 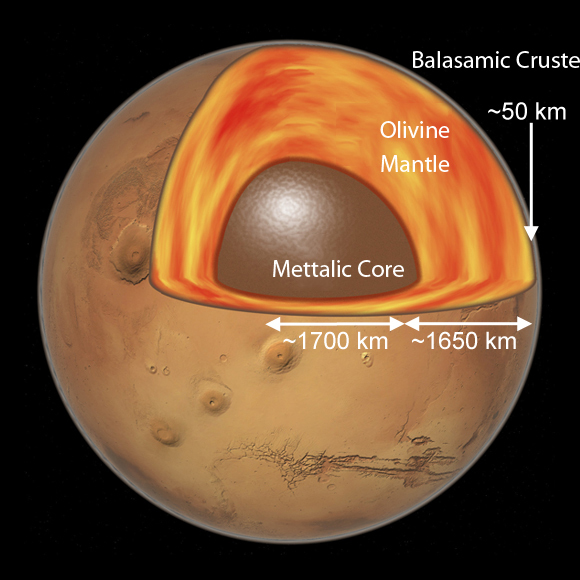 The red planet’s small core is thought to be partially liquid and probably made up of iron and other lighter minerals like iron sulphide. Less dense than the core, the mantle is thought to be composed chiefly of olivine and pyroxenes, minerals rich in iron and magnesium. The crust forms an envelope of volcanic rock. Its surface, covered in red dust, reveals a chaotic past marked by volcanic activity, flowing water, erosion and meteorite impacts. The surface is heavily cratered mainly in the southern hemisphere, while the younger volcanic plains of the northern hemisphere are more sparsely cratered. A system of deep canyons, Valles Marineris, runs from west to east. Like Earth, Mars has two permanent polar ice caps of varying extent. The south pole is higher and colder, with more seasonal carbon ice, while the warmer north pole has more water ice than our own “blue planet”. 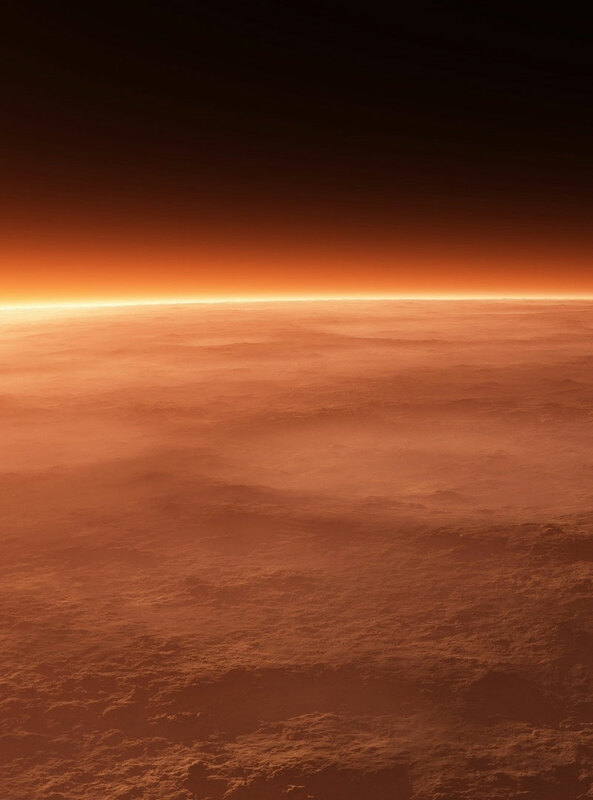 Mars’ atmosphere is 96% carbon dioxide (CO2), 2% argon (Ar) and 1.9% nitrogen (N2 and NO), with traces of oxygen, carbon monoxide (CO), water vapour and other gases. Atmospheric pressure varies according to the complex cycle of condensation and ice sublimation at the poles, but it remains very low compared to Earth (less than 1%). CNES took part in the Mars Express mission led by ESA, which sent a probe to Mars in 2003 to map it, analyse its subsurface and study its atmosphere. The agency supplied technical support and funding for development of two instruments and was responsible for the "ground segment" communicating with the third instrument. 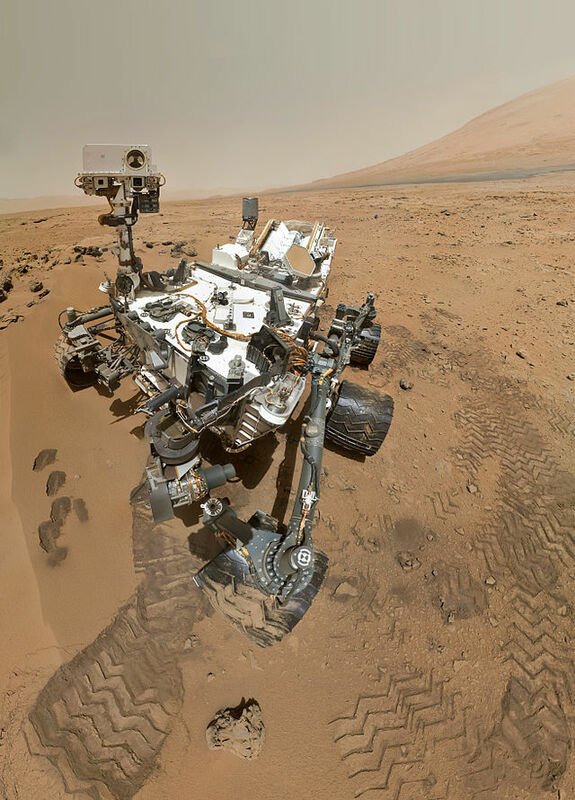 CNES is also involved in the Mars Science Laboratory (MSL) mission led by NASA, which landed the Curiosity rover on the planet’s surface late in 2011. The rover is trekking across a region of Mars to characterize its geology, analyse its climate, determine its habitability and lay the foundation for crewed missions. CNES oversaw the rover’s French instruments, ChemCam (CHEMistry CAMera) and SAM (Sample Analysis at Mars). The agency is also in charge of running the French Instruments Mars Operations Centre (FIMOC) at its Toulouse Space Centre. CNES is also working on NASA’s future InSight mission to probe the interior structure of Mars in order to better understand how rocky planets formed. The agency is overseeing development of the mission’s main instrument, the SEIS seismometer (Seismic Experiment for Interior Structures), designed to take the red planet’s pulse. 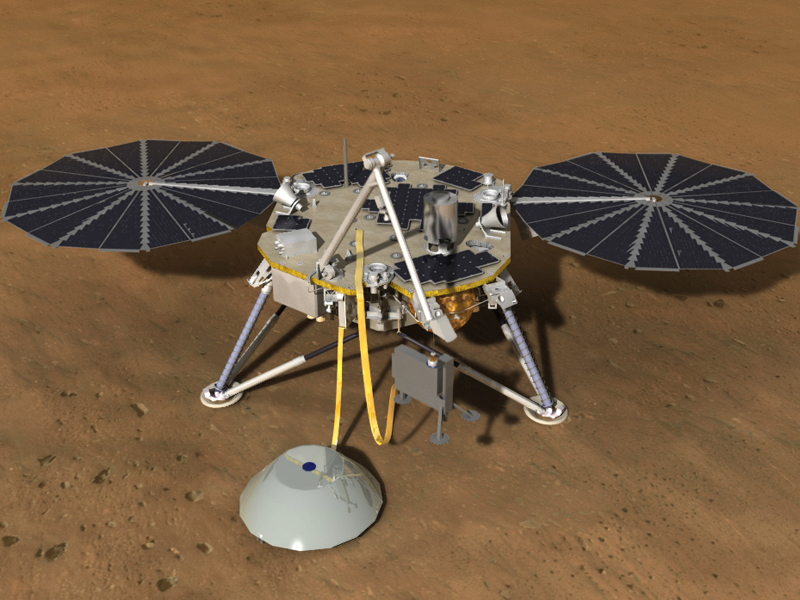 The InSight mission lander. Credits: NASA. CNES is also involved in ESA’s dual ExoMars mission. 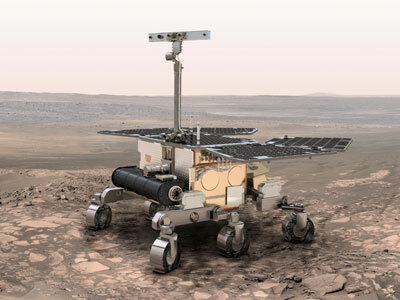 French research laboratories are in charge of two instruments on the Pasteur rover for ExoMars 2020: MicrOmega, a microscope that will analyse the mineral composition of samples collected, and WISDOM, a radar to probe the subsoil and characterize its structure. CNES also worked on the atmospheric entry and descent of the 2016 lander and is supplying visual navigation software for the 2020 rover.